While Microsoft attempts to keep tight-lipped about the hardware it’s working on, much of its secrecy can be undone when patents it’s submitted are unearthed, which gives us an idea what to expect from the company in the future. 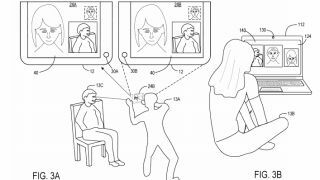 The patent is titled 'Three-way video calling on hinged multi-screen device', which gives us a hint as to what such a device would be used for. With Microsoft owning Skype, the video calling service, it makes sense that the company would consider designing a device that specializes in video calls. According to the patent, the device would feature two displays, and both of those screens will also have a camera. The idea is that this device will display images captured by the cameras on the two screens, while also displaying an image from a remote computer – for example someone using Skype to video-call from another location. If two people are video-calling together from the same place (such as the living room of your house), this means squeezing into the frame of a single camera. The patented device would make things easier, as all users could comfortably appear in front of the various cameras. Of course, as with other patents, the device may never make it to market, but it’s an interesting look at the kind hardware Microsoft is considering.